After six months of repair work, the scaffolding is down, the netting cleared away and for the first time in a long time I have daylight coming into my apartment. Now that I have use of the balcony again, the vexing question: to hang the washing out or not? A quick survey of the flats and houses in the vicinity suggests that most people are still drying their clothes inside - maybe 10% have washing outside. But it's a lovely day and I take the opportunity of putting the 'futon' bedding out - the first time they've been aired since the disaster. What a change from the old days when Japanese would put everything out in the sunshine: to air, kill the bugs, and make soft and fluffy. The bedding would plump up so much it wouldn't fit back in the cupboard! Anyway, here are some Before and After pictures to show you how things have changed round here. Badly damaged tile roof replaced with a newer, lighter roof. The temple was demolished within weeks and a new one opened just recently. This was the most dramatic damage in Koriyama. Rumour has it that the owner wanted more space, and contravening building regs, removed the pillars in the ground floor office. Now it's a car park. The church hall (white building with red roof) was unsafe so had to be pulled down. 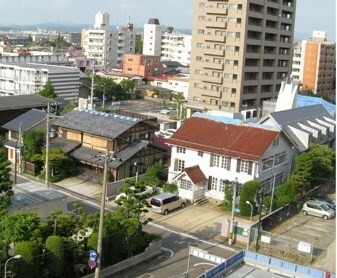 The house to the left is a 'soba' noodle restaurant. It took a long time (shortage of workers, shortage of tiles) but the roof tiles on the ridge were eventually replaced in November. Tsk. Well, at least you're all alright. And at least your flat is alright enough that you're still able to stay in it. Hopefully, the roof is still in one piece because that's your last solace there: to have it not crumbling about and falling around you.